Someone recommended that I play "this weird dancing game" at PAX East. 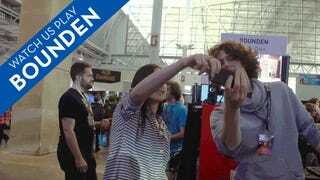 I wasn't sure what to expect when I saw people spinning around with an iphone between them, but Bounden is easily one of the most fun games I played all weekend. I first played Bounden with the game's producer, and immediately saw how much fun this game could be. As with real dancing, it looks much better when there's someone experienced leading the pair. You can see in the video as it switches from Tina playing with me, to playing with the game's designer, Adriaan de Jongh. Bounden is scheduled to come out May 21st for iOS and Android devices. Until then, try Game Oven's other spectacularly silly free iPad game, Fingle.